We are now accepting reservations for 2015. A spectacularly located and comfortable holiday home with 12m solar heated swimming pool in extensive grounds with fabulous views. House is tastefully and comfortably furnished. Outdoor hot tub, gym, sauna, wireless internet, and log fires. A particular feature of the property is that it is for two to six people yet is not part of a complex. there is a high degree of privacy. We have had hundreds of satisfied guests from all over the world and we have a house book full of appreciative comments. DeiMori La Massa proves very popular and we recommend early reservation. This property usually ‘sells out’ – we have guests who regularly return. We are now taking bookings for Season 2015. We are spectacularly located in a prominent elevated position in a South facing valley which brings long hours of sunshine and a favourable micro climate. The house is approached by a lane which winds its way from the main road, crossing over a river by an ancient bridge and then winding upwards through olive groves to reach the property. There are extensive private wooded grounds which drop away from the house giving a real sense of privacy and peace. The whole atmosphere is one of utter tranquillity – we are far from any major road and the only sounds are the splash of the water as it tumbles from rock to rock, the birds and the summer calling of the crickets. At night, we are far away from any light pollution and guests always enjoy the brilliance of the stars and the closeness of the moon. There is nothing to spoil the view and to witness a ‘La Massa’ morning is truly magnificent – the light has a wonderful brilliance and luminescent quality which never fails to enthral. 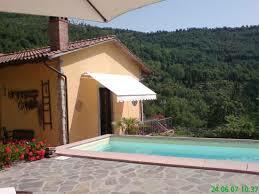 The Guest Accommodation is situated in a wing of the house and has a private entrance and furnished sun terraces. The whole has been completely refurbished, decorated and furnished to a high standard. The living area is comfortable with sofas and individual armchairs, a hardwood dining table and chairs and occasional furniture. The kitchen area is finished and equipped to a high standard by an exclusive Italian designer and manufacturer. There is a wood-burning stove for the cooler evenings and the whole suite is centrally heated for winter use. The bathrooms(s) feature large high quality shower cubicles with ‘power shower heads’, wash hand basins and WCs with bidet showers. The bedroom(s) have new beds, quality linen and plenty of storage space. We have a 12 metre ‘L’ shaped and landscaped solar heated pool which has a good length for lap swimmers. We have an outdoor spa pool with wonderful views. We have a very well equipped gym and sauna (small extra charge for sauna).